You can use SQLite to store and retrieve data in a light-weight database on the users device. This guide shows you how. ✔️ SQLite is light-weight and self-contained. It's a code library without any other dependencies. There's nothing to configure. ✔️ There's no database server. The client and the server run in the same process. ✔️ SQLite is in the public domain so you can freely use and distribute it with your app. ✔️ SQLite works across platforms and architectures. You can read more about SQLite here. We recommend that you use either the Entity Framework Core or the open-source SQLite library built by Microsoft. Entity Framework (EF) is an object-relational mapper that you can use to work with relational data by using domain-specific objects. If you've already used this framework to work with data in other .NET apps, you can migrate that code to a UWP app and it will work with appropriate changes to the connection string. To try it out, see Getting started with EF Core on Universal Windows Platform (UWP) with a New Database. The Microsoft.Data.Sqlite library implements the interfaces in the System.Data.Common namespace. Microsoft actively maintains these implementations, and they provide an intuitive wrapper around the low-level native SQLite API. The rest of this guide helps you to use this library. We'll start with a basic UWP project, add a class library, and then install the appropriate Nuget packages. The type of class library that you add to your solution, and the specific packages that you install depends on the minimum version of the Windows SDK that your app targets. You can find that information in the properties page of your UWP project. Use one of the following sections depending on the minimum version of the Windows SDK that your UWP project targets. If you're using Visual Studio 2015, click Help->About Microsoft Visual Studio. Then in the list of installed programs, make sure that you have NuGet package manager version of 3.5 or higher. If your version number is lower than that, install a later version of NuGet here. 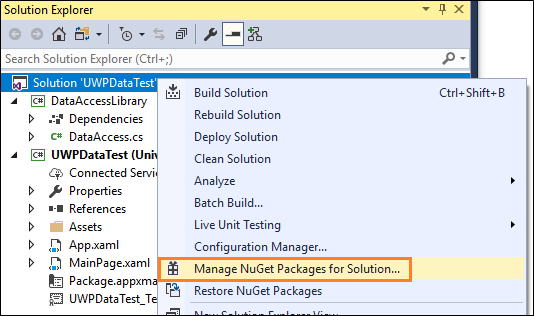 On that page, you'll find all of the versions of Nuget listed beneath the Visual Studio 2015 heading. Next, add class library to your solution. You don't have to use a class library to contain your data access code, but we'll use one our example. We'll name the library DataAccessLibrary and we'll name the class in the library to DataAccess. 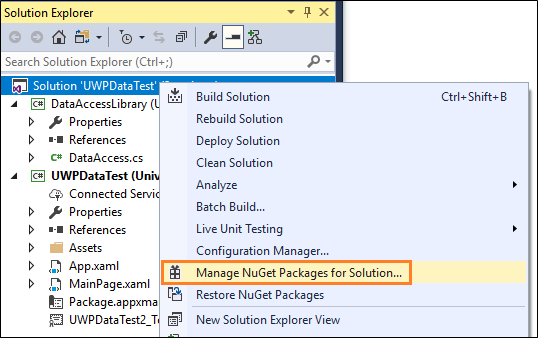 Right-click the solution, and then click Manage NuGet Packages for Solution. If you're using Visual Studio 2015, Choose the Installed tab, and make sure that the version number of the Microsoft.NETCore.UniversalWindowsPlatform package is 5.2.2 or higher. If it isn't, update the package to a newer version. Choose the Browse tab, and search for the Microsoft.Data.SQLite package. Install version 1.1.1 (or lower) of that package. Move onto the Add and retrieve data in a SQLite database section of this guide. There's a couple of benefits to raising the minimum version of your UWP project to the Fall Creators update. First off, you can use .NET Standard 2.0 libraries instead of regular class libraries. That means that you can share your data access code with any other .NET-based app such as a WPF, Windows Forms, Android, iOS, or ASP.NET app. Secondly, your app does not have to package SQLite libraries. 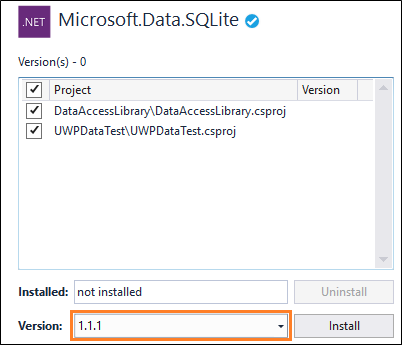 Instead, your app can use the version of SQLite that comes installed with Windows. This helps you in a few ways. ✔️ Reduces the size of your application because you don't have to download the SQLite binary, and then package it as part of your application. ✔️ Prevents you from having to push a new version of your app to users in the event that SQLite publishes critical fixes to bugs and security vulnerabilities in SQLite. The Windows version of SQLite is maintained by Microsoft in coordination with SQLite.org. ✔️ App load time has the potential to be faster because most likely, the SDK version of SQLite will already be loaded into memory. Lets start by adding a .NET Standard 2.0 class library to your solution. It's not necessary that you use a class library to contain your data access code, but we'll use one our example. We'll name the library DataAccessLibrary and we'll name the class in the library to DataAccess. At this point, you have a choice. You can use the version of SQLite that is included with Windows or if you have some reason to use a specific version of SQLite, you can include the SQLite library in your package. 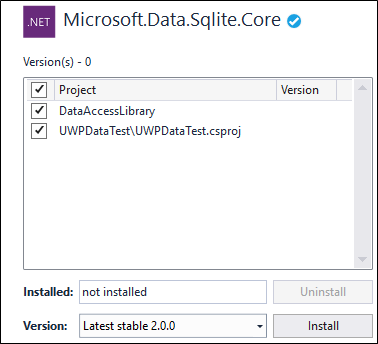 Let's start with how you use the version of SQLite that included with Windows. Choose the Browse tab, and search for the Microsoft.Data.SQLite.core package, and then install it. 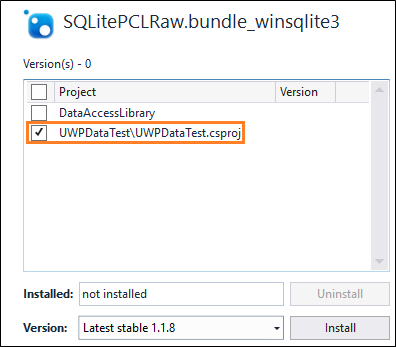 Search for the SQLitePCLRaw.bundle_winsqlite3 package, and then install it only to the UWP project in your solution. You don't have to do this. 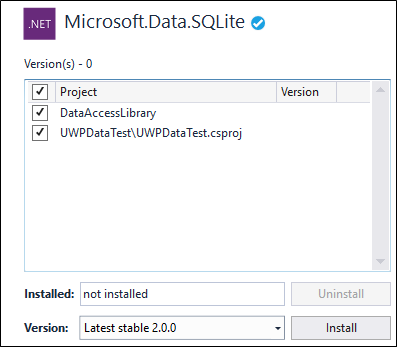 But if you have a reason to include a specific version of SQLite with your app, choose the Browse tab, and search for the Microsoft.Data.SQLite package. Install version 2.0 (or lower) of that package. 1️⃣ Prepare the data access class. 2️⃣ Initialize the SQLite database. 3️⃣ Insert data into the SQLite database. 4️⃣ Retrieve data from the SQLite database. 5️⃣ Add a basic user interface. From your UWP project, add a reference to the DataAccessLibrary project in your solution. Add the following using statement to the App.xaml.cs and MainPage.xaml.cs files in your UWP project. Open the DataAccess class in your DataAccessLibrary solution and make that class static. While our example will place data access code in a static class, it's just a design choice and is completely optional. Add the following using statements to the top of this file. Add a method to the DataAccess class that initializes the SQLite database. This code creates the SQLite database and stores it in the application's local data store. In this example, we name the database sqlliteSample.db but you can use whatever name you want as long as you use that name in all SqliteConnection objects that you instantiate. In the constructor of the App.xaml.cs file of your UWP project, call the InitializeDatabase method of the DataAccess class. Add a method to the DataAccess class that inserts data into the SQLite database. This code uses parameters in the query to prevent SQL injection attacks. Add a method that gets rows of data from a SQLite database. The Read method advances through the rows of returned data. It returns true if there are rows left, otherwise it returns false. The GetString method returns the value of the specified column as a string. It accepts an integer value that represents the zero-based column ordinal of the data that you want. You can use similar methods such as GetDataTime and GetBoolean. Choose a method based on what type of data the column contains. The ordinal parameter isn't as important in this example because we are selecting all of the entries in a single column. However, if multiple columns are part of your query, use the ordinal value to obtain the column you want to pull data from. In the MainPage.xaml file of the UWP project, add the following XAML. This basic user interface gives the user a TextBox that they can use to type a string that we'll add to the SQLite database. We'll connect the Button in this UI to an event handler that will retrieve data from the SQLite database and then show that data in the ListView. In the MainPage.xaml.cs file, add the following handler. This is the method that we associated with the Click event of the Button in the UI. That's it. Explore the Microsoft.Data.Sqlite to see what other things you can do with your SQLite database. Check out the links below to learn about other ways to use data in your UWP app. See Use a SQL Server database in a UWP app. See Share code between desktop and UWP. See Customer Orders Database sample.